Our private online community for MDs, CEOs, executives and business owners, MyVistage enables members to connect between groups meetings, tap into the broader international Vistage community, learn from expert speaker videos and access bespoke best practice materials. Manage your group meeting online, raise issues to be processed, set your personal goals and engage with the other members of your group in a secure environment. Engage with industry influencers across the worldwide Vistage community and connect with 21,000 members who can help you get answers you need for your business. Ask questions and participate in discussions with community members to help your business and explore the Marketplace to discover new opportunities..
A library of articles, tools, resources and member best practices designed to provide you with everything you need to achieve success (or further success) in your business. Each toolkit is built out with expert information carefully chosen and edited to provide a comprehensive level of insider expertise you’re not likely to find anywhere else. Looking to equip your business with updated, cutting edge Technology? Feel the need to develop a more comprehensive Human Resources system to help make your team as effective as possible? Does your Marketing & Sales plan need updating? Maybe your Strategy & Management or Business Operations skills could use a refresher — after all, the most successful leaders know when to seek outside help to complement their own personal areas of expertise. Whatever the case, you’ll find the information you need right here at Vistage Best Practices. 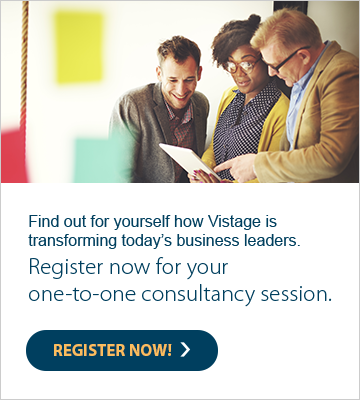 Watch inspirational and informative videos from Vistage speakers and thought leaders by accessing Vistage Studio from the MyVistage member portal. From Leadership, Growth & Strategy, and Beyond Business to Human Resources, Management & Operations to Marketing & Sales, Vistage Studio is a one stop shop for online learning.